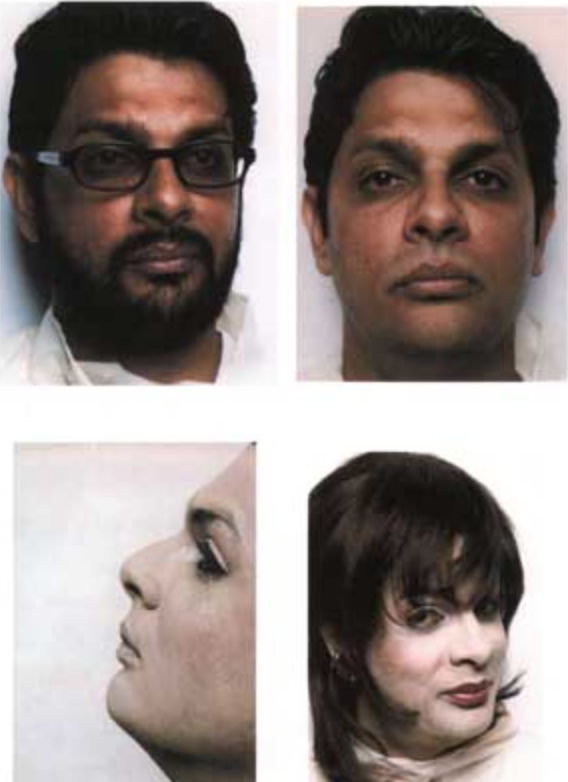 Colored Folks was a collaboration between Oreet Ashery and Shaheen Merali ( 2001). The remits set for the work were for Merali to imagine the idea of ‘becoming a white woman’ (who, why, how?) while Ashery was to imagine the idea of ‘becoming a black man’. Those imagining took the shape of a series of conversations over many months between the two. The conversations raised issues and questions around gender, identity, racism ( black facing and white facing of Asian and Black actors) and notions of ‘becoming’, as well as the sociopolitical conditions of the two artists as minorities. Colored Folks was first performed at Toynbee Studios, where Ashery and Merali spent several hours being transformed by the late make-up artist and stylist Brixton Bradley in a room away from the audience. A live feed projected the footage onto a monitor in a second room, where people could watch the progress. A VJ mixed footage from the previous months’ conversations leading up to the performance with the live footage from the performance itself, distorting the sense of time. At the end of the performance, Merali and Ashery stood facing each other at the exit door, while audience members had to squeeze out through the door, pressing against the made-up performers. The work was made at a time ( 2000- 2001) when it was part of a large and perfomative body of work of myself ‘becoming’ various figures of men; looking at constructions of gender, race, ethnicity, religion and masculinity. I performed as an Arab man, a Muslim man, an Orthodox Jewish alter ego (for which I was accused of Anti-Semitism on occasions), a Sufi saint and a Turkish Jewish-come-Muslim Messiah. It is in this context that I performed the artificial and impossible construction stage by stage of’ ‘becoming’ a black man with Merali ‘becoming’ a black woman. At the time I was also looking at racist and anti semitic representational relationships of black and Jewish immigrant identities. 17 years later, some of the work that exist now in distribution is a fixed photographic documentation of the original performance at Toynbee Studios – depicting myself – Ashery – ‘becoming’ a black man and is divorced from the discursive context and intentions of the original live performance and process-based work. Where there is access and possible, the work will strive to be distributed within its political and discursive intentions.